We are gearing up for our spring show on Saturday, April 30th, 2011 and hope you will join us.! Rusted Art, Rat Rods, Under Construction, Hot Rods, Euros, Trucks, Bikes, Imports, Classics, Restores, Race Cars, Exotics, Sport Cars, Luxury and more rolls in and we welcome them all! We need your support to make a difference in the community so please consider attending this event and helping the kids of Oakland Terrace! If you are a community business or individual that would like to help or be apart of this event (or even next year 2012), please contact us. Saturday April 30th Car Show. 10:00 am - 3:00 pm (car/truck/bike show registration 9:00 am to 11:00 am). Bring the whole family and have some fun with us! $20.00 vehicle registration to show; free to the general public to enter, $15.00 Kid's Arm Band for all activities all day. Kid's model car contest is free to enter by any child with any vehicle up to 12" in size. Kid's give-a-ways are free for kids to enter (any child can register, must be present to win), silent auctions will run from 10:00 am to 1:45 pm (must be present to bid), food & drinks & more will be sold from 9:30 am till 2:15 pm, All proceeds to benefit the kids of Oakland Terrace Elementary School. Zach Statom will be playing live on the cafeteria stage from 10:30 to 11:15 am! Kid's Talent Show will be playing live on the cafeteria stage from 11:30 to 1:15 pm! Outlaws BBQ will be on the scene selling the best darn food around. Outlaws BBQ gives a good portion back to the kids and providing other help with this event and to TOCC as a whole. Pork Sandwich, Pulled Chicken Sandwich, Outlaw's Bandit Bowl, Hamburgers, Hot Dogs, Corn Dogs, French Fries, Baked Beans, Cole Slaw, Funnel Sticks and more will all be sold at a special price to benefit the kids! Maddie's La Casita will be donating 500 servings of handmade Nacho's w/ a cheese & Bean Dip and salsa that will be sold for $3.00 (all handmade) with all proceeds given back to the kids! Pepsi & Buffalo Rock is providing ice cold sodas (Pepsi products, cup with ice) - sold for a $1.00, with proceeds given back to the kids! 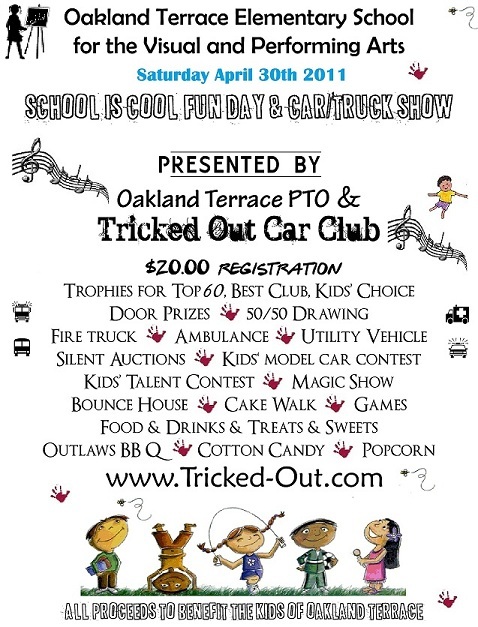 Oakland Terrace PTO will be selling popcorn, cotton candy, Sno Cones and other sweets & treats - all sold at a low price with all proceeds, and hosting various activities throughout the school - all given back to the kids! Kids of Oakland Terrace - making art for sale, assembling various gift baskets full of all sorts of store goods for silent auction - all proceeds go to each classroom fun and to the kids! They will be on stage as well for a free talent show to all, ranging from singing to dancing and more! Arnold's Ice Cream Truck - will be on the site all day selling cold treats with a donation of sales to the kids of Oakland Terrace! The Sleep Center is giving door prizes and a new xBox game system to be given away to a kid (1st - 12th grade kids only), and once again providing marketing for this show ($10,000 package) - all to benefit the kids! 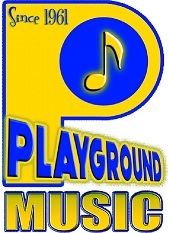 Our platinum sponsor for three years running. Panama City Auto Repair bought two tricked-out kid's bikes to be given away (1st -5th grade kids only) that are valued at around $1,000. Plus they tossed in some stuffed toys, and some free oil changes as well - all given to benefit the kids! Kickback Charters is giving us a full feature fishing charter ($1,200.00 value) to be auctioned off to someone, with all proceeds to benefit the kids! Tell your fishermen to stop by and bid - no need to have a car registered to bid on the many silent auction items. Sparkles Detail will be displaying the full Croftgate USA car care product line, giving out some door prizes, and providing other help to make this show success for the kids! Gulf World Marine Park will be giving us a 16 student (plus 4 adults) field trip to the top academic achievers in a school-wide contest for grades kindergarten through fifth! Along with this generous gift to stir excitement and moral amongst the kids, they are throwing in a few extra goodies as well. Hot Wheels Car Club will be our DJ for the day, playing tunes and keepin' the mic hott! They are here to help the kids succeed! Plus other surprises to be revealed at the show. No problem! Come eat lunch and buy some kid's art or bid on a silent auction item and help the kids' succeed! Your help is truly needed!! Bring the kids, bring the family...bring yourself and help us help the community! Stay an hour, grab some lunch to go, or spend the day!!! The school is open for the Fun Day part...the road in front of the school is closed for the car show. We all park on the road and have a block party! We can park 200 rides easily with room to grow if needed. All vehicles will be on pavement. There will be a bouncy house, bouncy basketball and 20 + games and activities, and more for the kids. Plus a kid's talent show on stage (in the cafeteria, which is air conditioned and there are tables, chairs and restrooms). 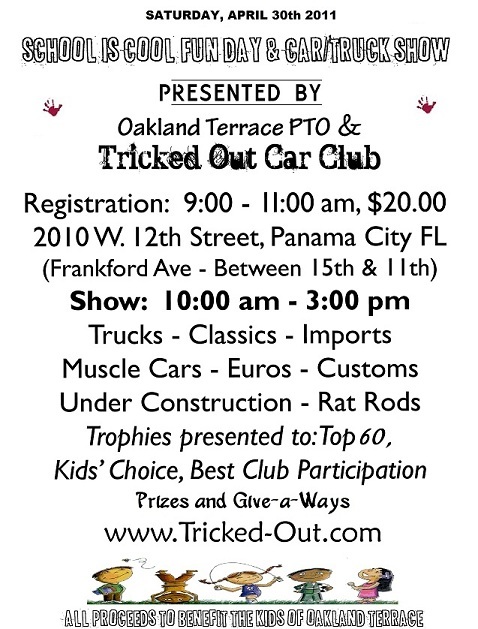 And to start the kids out right as auto enthusiasts...a TOCC toy model car/truck/bike contest with voting and awards (we have done this at all of our shows) - free to enter and open to all ages! This community event is free to the public, with all kids activities costing a ticket (25 cents) or an unlimited arm band for $15.00 that lets the kids do everything unlimited, all day (except food & drinks)....and all kids games have prizes of various value for the kids to win! Free Kid's Give-a-way: Child must register between 10:00 am and 1:30 pm (no cost) and be present between 2:00 - 3:00 pm to win prizes. Prizes range from 20" Kids bikes to xBox, to action figures to Hot Wheels to dolls and more. Hundreds of dollars in free stuff JUST FOR THE KIDS (must be present to win). Adults cannot enter, all children must be present to register and win. Bounce House: Bouncy House and other inflatable fun! Raffles: featuring Kids' Art and store-bought, kid assembled themed baskets and more! A 50/50 drawing to benefit the Sims Veteran's Home! Top 60 Car/Truck Trophies - Car Show entrants' voting. Top 3 Motorcycle Trophies - Motorcycle entrants', Car Show entrants' and general public voting. *All show cars must be parked and registered by 11:00 am. Silent auctions will be awarded at 2:15 pm and awards presented in the closing ceremony (2:30 - 3:00 pm). 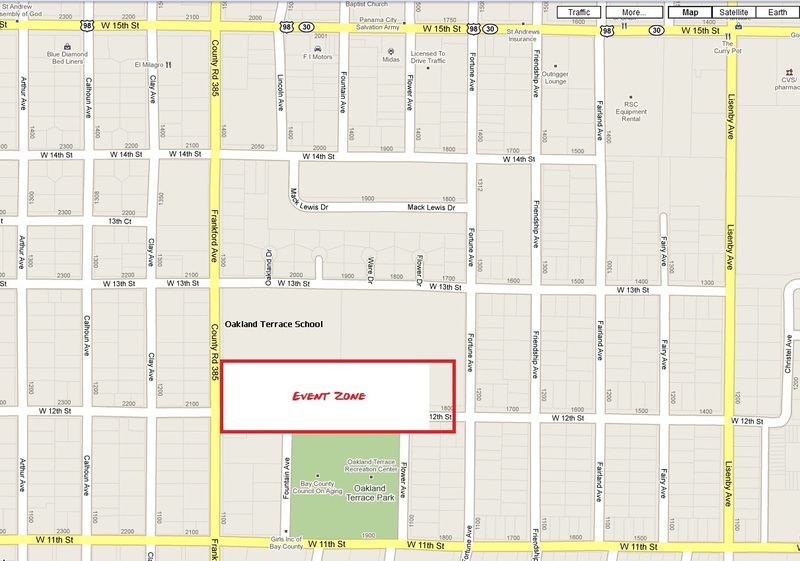 This will be held at Oakland Terrace Elementary School, (12th street off Frankford Ave between 11th St and Hwy 98). Show cars need to start arriving at 9:00 am. $20 donation to the Oakland Terrace PTO, per car. Goodie bags to first 125 registered, door prizes and other give-a-ways. Fun contest for the Kids! Info: Kids can bring one small model / toy car and register it and show it to win. They will be voted on by the entrants (both kids & Adults) and there is no cost to enter. Just sign up anytime on location from 10:00 am to 11:30 am. Judging will be from 11.00 am to 12:00 noon and awards presented in the closing ceremony (2:30 - 3:00 pm). Any car/truck/bike smaller than 12" long is accepted, including R/C and electric toys. 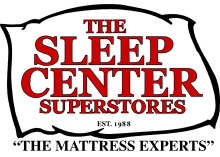 The Sleep Center - Panama City's Mattress Experts! Panama City Auto Repair - Your one stop shop for all things automotive! KickBack Charters - The Finest Sport Fishing Fleet In Panama City Beach, Florida! Sparkles Detail - Exclusive Distributor of Croftgate USA Waterless products! Outlaws BBQ - Yummy is a huge understatement! Maddie's La Casita - Mexican restaurant, all hand-made with special care! Gulf World Marine Park - It's always showtime at Gulf World! US Speedo - US Speedo is the leader in OEM quality gauge faces for the aftermarket! Seatow - Where Boaters Belong™! Alexan Pier Park - Live Life like you're on vacation! Eddie's Auto Body - Offering quality auto repair with reasonable prices! PC Dominos Pizza - Panama City's pizza headquarters. New Speed, LLC. - Racing forward to success! New Beginnings Custom Chrome - Polishing, Plating and Restoration Experts! Red Lobster - Preparing seafood over a wood-fired grill is an art! MICA Specialties - Web Development & Technology Consulting for the small business and consumer! Steve's Bike Shop - Finest bike shop with the friendliest professionals! 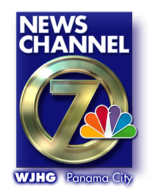 WJHG TV NEWS 7 - Coverage You Can Count on! Hot Wheels Car Club - TOCC's extended family! Play N Trade - Where the gamers go! Pepsi - PC is Pepsi Country! Buffalo Rock - Caring community leaders! Auto Zone - My Zone for the Do-it-yourselfers! Panama City Police Department - To Protect & Serve the citizens of Panama City. Island 106 - Home of "That Guy" Kramer! Chili's - Are you wild or mild? Arrow 95.9 - Cool tunes! Hunts Oyster Bar - Eat 'em Raw! Mobile Solutions - Car Audio Store! O'Charlies - We put the OHs in good food! Golden Corral - Help yourself to happiness! O'Reilly's Auto Parts - Professional Parts People! CW Network - TV's premier station! Uncle Ernie's - Bayfront Grill & Brew House! Hanks FM 103.5 - All that you want and more! Applebee's - There's no place like the neighborhood! Cheese Barn - Local's spot for downtown dining! Sonic Drive-Ins - America's Drive-In! The Celebration Place - Your One Stop Wedding & Party Shop! Plum Delightful - Antiques & Jewelry with Mason's Way Wine Bar! Many auto enthusiasts from Florida, Georgia, Alabama, Mississippi and Texas.